Background: Images are widely stored and transformed over public channel for communication, medical purpose or organizational uses. Mostly the images are collected from the remote location, therefore the confidentiality of the data becomes the most important matter of concern. The most convenient way to protect the data (image) is to encrypt it right after the capturing the images from the sensors at remote locations. There are a large number of patents registered till date. We have covered all the benchmark and important patents on encryption. Objective: This paper furnished an enhanced secure encryption scheme to assure the confidentiality of images at the time of transmission or storage. There are numerous encryption algorithms proposed in the recent days, most of them are not suitable for image encryption due to their high computational overhead and design structure. The proposed scheme has comparatively low computational overhead as it uses 2D DWT for decomposition of the image and chaotic maps for generating pseudo random numbers sequence (PRNS). Methods: The scheme is based on 2D DWT and chaotic maps. The scheme can be divided into two basic phases. In the first phase, it permutes the image using pseudo-random numbers generated by Arnold’s cat map followed by a transformation in 2D DWT for diffusion based on enhanced piece wise linear chaotic map (EPWLCM). Results: The proposed scheme was tested statistically with promising results. Therefore, the proposed scheme is secured from any attack, has light weight and is effective. Conclusion: The proposed scheme highly reduced the computational complexity, but without compromising the security. A number of tests were done and the results obtained were satisfactory. The scheme may simply be modified for color image or any other kind of data encryption. 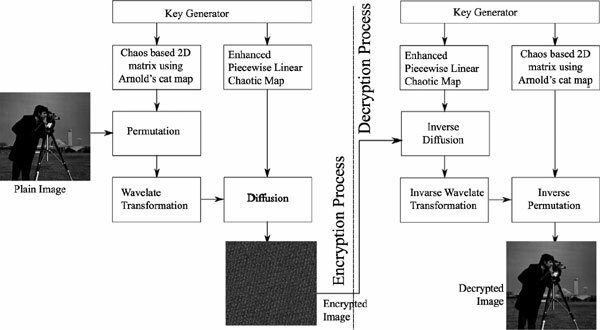 Arnold cat map, DWT, encryption, enhanced piece wise linear chaotic map, permutation, PRNG.